The Congregation of the Sisters of the Eucharistic Heart of Jesus was founded in 1943 by late Archbishop Leo Hale Taylor of the Society of African Missions. He was born in 1889 in the Diocese of Duluth U.S.A. He was received into the Society of African Missions in October 1911 and ordained to the Priesthood on 21st of June 1912. After the Great world war he was transferred to Nigeria and in 1934 was appointed Bishop of the Vicariate Apostolic of Bight of Benin and later transferred to Lagos after the death of Bishop Francis O’Rourka S.M.A. in 1938. From 1940 until his retirement in 1965 he was in charge of the Archdiocese of Lagos. In 1940 providence brought to the Coast of West Africa, Cardinal Riberi as Papal Delegate to the British East and West African Colonies. IN that capacity he visited Lagos and was quick to notice the absence of African girls in the rank and file of the religious and stressed the tremendous need for African Sisters in Nigeria. Archbishop Leo Hale Taylor took up the challenge and in 1943 founded the Congregation of the Sisters of the Eucharistic Heart of Jesus. The Congregation started at Abeokuta with five Postulants, having as its first Novice Mistress and Superior General the late Rev. Mother Enda Barrett O.L.A. Later in 1946 the Congregation moved its Novitiate and Mother House to Ibonwon. The Congregation was successfully ruled by Rev. Superior General Berardin, Eli, Patrick, Benedict and Columcile – all Missionary Sisters of Our Lady of Apostles Congregation. The Founder’s “whole purpose for founding the Congregation is to have educated African Sisters that must stand by its Constitutions”. He believed firmly that the Congregation thus founded will be ‘a great missionary power’. The founder was quite insistent on the observation of very strict religious exercises. Emphatically he maintained that although there are great needs for the performance of the works of mercy and charity, the sisters were not founded chiefly to supply these needs. Realizing that they will not be able to perform their duties properly without thorough training he insisted on their being properly trained in the understanding and practice of the religious life. They are chiefly to exercise the virtues of religion and to do good in so far as this helps them to be holy. (Ref. Founder’s Letter to Rev. Mother Berardin – 19th of January 1947 and to Rev. Patrick 29th of January 1957). Above all Archbishop affirmed that a true Eucharistic Heart of Jesus Sister’s life must be centered on the daily celebration of the Eucharist. 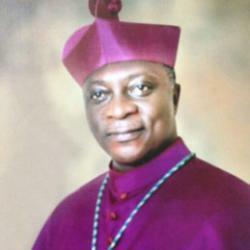 Archbishop of Metropolitan See of Lagos. 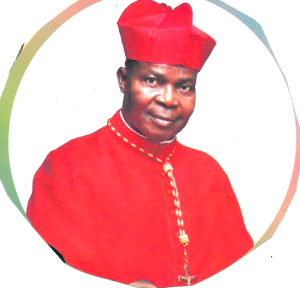 Following the retirement of His Eminence, Anthony Cardinal Okogie of Lagos having reached the canonical age, the Holy Father Pope Benedict XVI on May 25, 2012 appointed Bishop Alfred Adewale Martins as his successor to the See of Lagos. He becomes the fourth Archbishop of the See of Lagos after Late Archbishop Leo Hale Taylor SMA (1950-1965); Late Archbishop Kwao Amusu Aggey (1965-1972) and Anthony Cardinal Okogie (1973-2012). Most Revd Alfred Martins was installed as the Archbishop of Lagos on the 4th of August 2012 at the Holy Cross Cathedral Lagos by the Apostolic Nuncio to Nigeria, Most Revd Augustine Kasujja.